You may love sage like I do, for flavoring stews and beans, or sautéed with melted butter over stuffed pasta. But have you ever considered enjoying sage for its own sake? If you’ve ever experienced the peppery, rather bitter taste raw sage, the thought might not appeal to you. But the heat of frying softens the taste, transforming the herb into something surprisingly delicate. 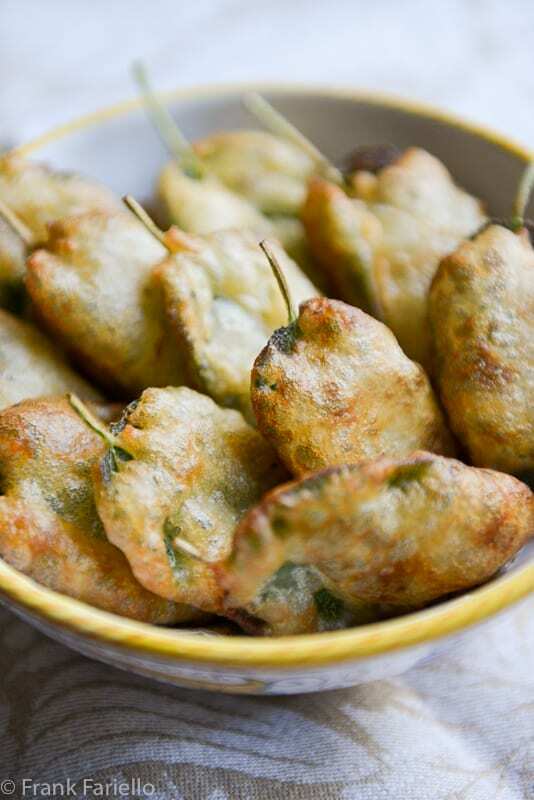 In this recipe, fresh sage leaves—the larger, the better—are scrupulously washed and dried, coated in a simple flour and beer batter and quickly fried to a beautiful golden brown. Generously salted and eaten while they’re still warm, fried sage leaves are a savory delight. Pick the sage leaves off the plant, leaving a bit of the stem attached to the leaf as a “handle”. Wash the sage leaves thoroughly in a bowl of cold, fresh water. Drain them and pat them dry with paper towels. Add the flour to a mixing bowl. Drizzle in the beer or mineral water, whisking vigorously as you go until you get a smooth batter, pourable but thick enough to coat a spoon well. Fry the sage leaves, keeping them well spaced, until they are golden brown on each side, about one minute or so for each side. Adjust the heat if needed so the oil is bubbling hot but not smoking. Drain the sage leaves on paper towels or a baking rack. Salt your fried sage leaves generously and serve them while they’re still warm. This dish is at its best when made with large sage leaves, larger than the ones that you will usually find in stores. Luckily, I had a surfeit of beautiful plump sage from the herb pot on the backyard terrace. Indeed, this is a nice way to use up that sage plant before the frost sets in. 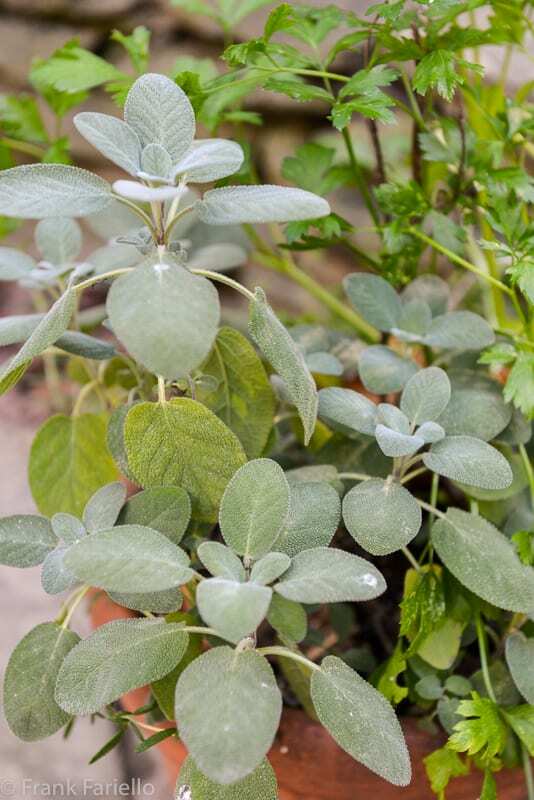 And especially if using home grown sage, do make sure to wash the leaves well in plenty of fresh, cold water to remove any dirt or other unwanted substances. The batter can be thicker or thinner according to your taste; the higher the flour to liquid ratio, the thicker it will be. It needs to be at least thick enough that it coats the sage leaves well. Personally I like the batter only just thick enough to coat the leaves, which produces a light, crispy crust. If you’re in the mood for a more substantial and savory crust, you can use an egg based batter: whisk together an egg and 100g/3-1/2 oz. flour, along with a few drops of water if you need it to get the consistency you want. And if you want a really puffy crust, you can separate the egg, whisk the yolk together with the flour and water, then gingerly fold in the whites, which you will have beaten separately until stiff, with a spatula. Although optional, I highly recommend the anchovy paste. It provides a nice extra layer of flavor. Just go lighter on the salt, as the paste is, of course, already quite savory. Pick the sage leaves off the plant, leaving just a bit of the stem attached to the leaf as a "handle". Wash the sage leaves thoroughly in a bowl of cold, fresh water, drain them and pat them dry with paper towels. Salt your fried sage leaves generously and serve them while they're still warm. Frank I can’t tell you how many friends I’ve made these for! And always with “wow” these are amazing! In the summer I love doing a bunch of zucchini blossoms and a heap of fried sage leaves…love at first bite! Great to her, Phyllis! It is something special! Hi Frank and wow Frank! :) Such a simple dish, and such a delicious meze! The plant in your photos looks a bit different from our own sage, which is perhaps a less mild variety, with its leaves more wrinkled on the underside. We’ll definitely try this one, it must be perfect as an appetizer! How unusual! I would love to try this. A glass of chilled prosecco and a plate of fried sage leaves, what more does one need? Definitely worth making at home. It’s so easy! I love sage! Would never have known that one could prepare the leaves in this manner! Grazie!! I love this Frank. I’ve made fried sage leaves as a garnish to different dishes, but never as something to be eaten on its own (although a good glass of wine is required here, I’d say). I have a surfeit of sage, so am going to try serving these next week. Wine, definitely… And do let us know how you like them. My sage plant in my garden was eaten by a goofer. I planted several new ones and as soon as the leaves are big enough I will make your fried sage, it looks fantastic. I would not leave out the anchovy paste. Sage is one of the herbs growing on my balcony and I use it to garnish risotto, spaghetti or make tea to heal sore throat, thanks to my grandmother’s knowledge of healing with herbs. This is completely new twist for me and I will gladly try it before cold days arrive. Grazie mille ! Tornero ! Thanks! Do let us know how you like it. I love fried anything! 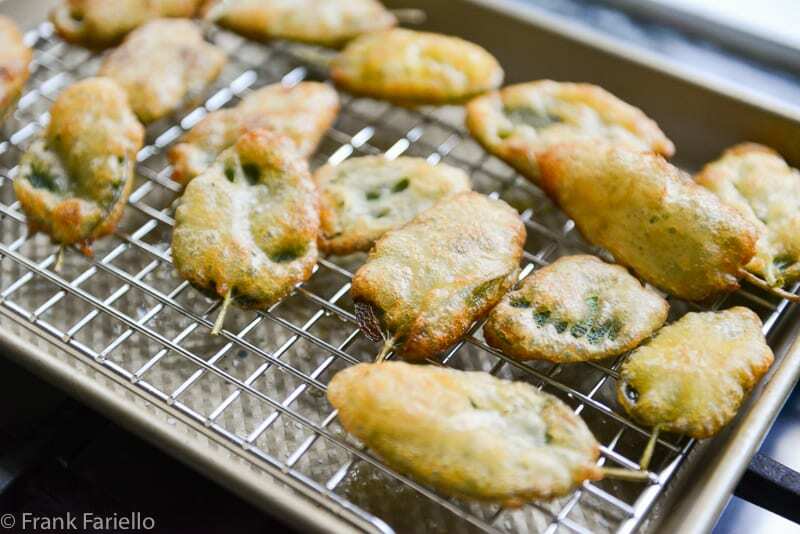 Haven’t had fried sage, but it sounds terrific — this is definitely something I’d like to try. Thanks! We fill ours with the anchovy paste and love it. But I should try your batter; methinks it superior to mine! I guess only time will tell. How do you make your pastella? The perfect recipe for my sage plant/bushes…can’t wait to try this! I, too, have a surfeit of sage right now. And before it is frozen, I need to make these. So delicious. I think you’ll enjoy them, Michelle. sono perfette con un calice di Prosecco ,voglio provare a fare questa pastella, grazie !Buon weekend Frank ! D’accordo, Chiara. Un calice di Prosecco sarebbe l’abbinamento perfetto. Buon weekend anche a te! I love sage. Unfortunately it’s a bit late for us here as my sage has already “gone over”. The last time we went to Tuscany, we were served ravioli in sage butter. I can’t remember the ravioli filling, but I certainly remember the delicious sage butter! Sorry to hear that, Susie! Of course, though not ideal, store bought sage will also work. And sage butter, yes, it’s wonderful on ravioli!